The Montessori method of education was developed by Dr. Maria Montessori, based on scientific observations of children from birth to adulthood. The Montessori method has been proven successful for more than 100 years in schools around the world. The Montessori perspective is that each child is naturally eager for knowledge and capable of initiating learning in a supportive, thoughtfully prepared learning environment. It focuses on the development of the whole child- physical, social, emotional and cognitive. Kawaiahaʻo Church School is an American Montessori Society Member School. Our teachers receive specialized training and our classes are equipped with hands-on materials focused on further developing hand-eye coordination, fine and gross motor skills and helping them learn more about geography, science, math, technology, arts and mathematics (STEAM). Visit our “Montessori Education” page to learn more. 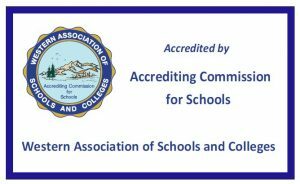 What are the school’s operational hours? We offer an optional Before School Care which begins at 7:00am. School begins at 7:45am- 2:30pm. 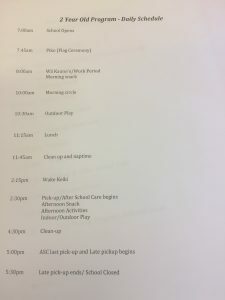 After School Care is available until 5:00pm with late pickup until 5:30pm. Please see our tuition schedule to view the prices for Before/After School Care and the late pickup option. Our After School Care is led by Aunty Taryn Halmos- Andres, who is our Christian Education Teacher. She loves spending time singing with the keiki, reading, and doing fun activities after school! 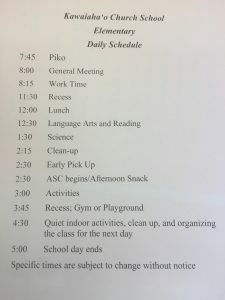 What is the typical day at school? Each class has a schedule posted on their walls, but here are some samples of what the daily schedules look like. The children have a great blend of instructional time, outdoor play, and time to do hands-on learning in a classroom setting both indoors and outdoors. Each day is full of music, reading, art, and fun! We do not provide lunches. Children have the choice of bringing home lunches or signing up with the Keiki Lunchbox program, which provides lunch at an additional cost. You may click here to visit their website. Lunch is an important learning and social experience for the child. If your child is brining lunch from home, please send a balanced lunch. We also know through research that the brain functions rely heavily on an ample water supply. The school provides bottled water from a cooler in each classroom. 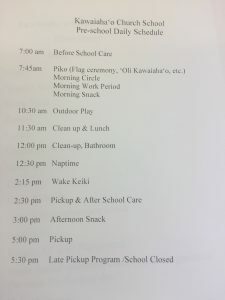 Kawaiahaʻo Church School will serve the children water at lunch. We provide a nutritious morning snack comprised of items such as whole grain waffles, fresh and dried fruit, greek yogurt, and crackers and cheese. Organic milk will also be served with morning snack. An afternoon snack is provided for those enrolled in After School Care. What if my child is not familiar with the Hawaiian language? We welcome all children! While our school is Christian, Montessori School with an emphasis on Hawaiian language and culture, most of our classes are English-based. We do offer a dual language class for the families that would like their keiki to have more exposure and instruction in the Hawaiian language. We integrate the Hawaiian language in all of our classrooms through mele (songs) and prayers (pule). Our teachers spend time teaching the keiki the songs and prayers and begin integrating Hawaiian words into their instruction when each child is ready. Many of our teachers are bilingual and speak English and Hawaiian. As the children progress to our Elementary Program, the teacher is able to meet them where they are at linguistically. How do the mixed aged classrooms work? The mixed age grouping encourages cooperation, collaboration, and leadership skills in a peaceful, community setting. For the younger children, they look up to the older children in the classroom and learn quickly by observing and following their lead. The older children gain confidence and leadership skills as they learn to teach and pass on the knowledge they’ve attained. 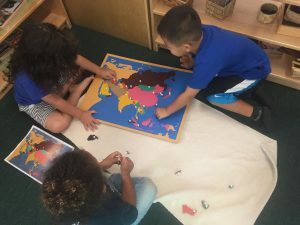 In this picture, these children ages 3-5 are working together on a puzzle. Each puzzle features a different continent, so children can learn more about geography. The older child is helping the younger children put it together. Teachers are also able to teach to the child’s level. Children are able to advance to the level they are ready for, keeping children excited and challenged as their curiosity for learning continues to grow. Does my child need to be toilet trained to start school? No, we accept toddlers at 24 months old and he/she does not need to be toilet trained to start school. Our trained teachers and staff will assist with this process.